At Blue Label Telecoms, we have a Level 1 ADR (American Depositary Receipt) programme sponsored by The Bank of New traded in the over-the-counter market. ADRs are negotiable U.S. securities representing a company's publicly traded equity or debt. They are publicly available to investors on a national stock exchange or in the over-the-counter market. They are created when a broker purchases the non-U.S. company's shares on the home stock market and delivers those to the depositary's local custodian bank, which then instructs the depositary bank to issue depositary receipts. (They may also be purchased in the U.S. secondary trading market). They facilitate U.S. investor purchases of non-U.S. securities and allow non-U.S. companies to have their stock traded in the United States by reducing or eliminating settlement delays, high transaction costs, and other potential inconveniences associated with international securities trading. They are treated in the same manner as other U.S. securities for clearance, settlement, transfer, and ownership purposes. Depositary receipts can also represent debt securities or preferred stock. They can either be sold to another U.S. investor or can be cancelled and the underlying shares can be sold to a non-U.S. investor, when the depositary receipt holder sells. ADRs facilitate portfolio diversification, risk reduction and international investment; overcoming many of the inherent operational and custodial hurdles of international investing. This is the simplest method for companies to access the U.S. and non-U.S. capital markets and they are traded in the U.S. over-the-counter market. Level 1 is the fastest growing segment of the depositary receipt business. Companies that wish to list their depositary receipts on a U.S. stock exchange (NASDAQ, American or New York), or who wish to raise capital or make an acquisition using securities, use Sponsored Level II or Sponsored Level III depositary receipts. These are exchange-listed securities but do not involve raising new capital. Level III programmes typically generate the most U.S. investor interest because capital is being raised. An ADR is a negotiable U.S. certificate representing ownership of shares in a non-U.S. corporation. ADRs are quoted and traded in U.S. dollars in the U.S. securities market. The dividends are paid to the investor in U.S. dollars. ADRs were specifically designed to facilitate the purchase, holding and sale of non-U.S. securities by the U.S. investor, and to provide a corporate finance vehicle for non-U.S. companies. What are the benefits of ADRs to U.S. investors? U.S. investors generally prefer to purchase ADRs rather than ordinary shares in the issuer’s home market because ADRs trade, clear and settle according to U.S. market conventions. One of the main advantages of ADRs is the facilitation of diversification into foreign securities. ADRs also allow easy comparison to securities of similar companies as well as access to price and trading information, if listed. ADR holders also appreciate dollar dividend payments and receiving corporate action notifications. Investors receive annual reports and proxy materials in English. ADR issuers generally have full information in English about themselves on their websites, as well as on the main depositary bank websites, and are better tracked by the main U.S. financial websites. ADRs listed on U.S. exchanges provide holders with the same level of information as any other U.S. security. Trading information is readily available, financials are reconciled to U.S. Generally Accepted Accounting Principles (GAAP), and the SEC regulates the Company's disclosure to investor. Blue Label Telecoms’ ADRs are not listed on a U.S. exchange , and Blue Label Telecoms does not provide U.S. GAAP financial statements. 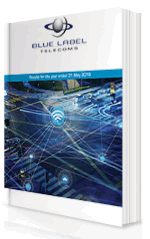 Where are Blue Label Telecoms ADRs traded? Who is the depositary for ADRs for Blue Label Telecoms? A registered holder is one whose name appears on the books of the depositary. The registered holder is considered the owner of record. A beneficial holder is one whose holdings are registered in a name other than his or her own, such as in the name of a broker, bank or nominee. Dividends are paid in U.S. dollars and are generally taxable, just like dividends on U.S. shares. In addition, taxes may be withheld by the ADR company's local government. Depending on individual circumstances, foreign taxes withheld might be applied as a credit against U.S. taxes, or tax reclaim opportunities may be offered. For dividend and corporate action information, please visit www.adrbny.com .Go to the DR Corporate Actions or DR Dividends & Distribution buttons on the vertical scroll bar on the left and then enter company name, CUSIP or symbol. How can I buy ADRs via a U.S. Broker? You can purchase Depositary Receipts through BNY Brokerage, Inc. BNY Brokerage Inc. is a wholly owned subsidiary of The Bank of New York Company and provides professional trade execution to meet all of your investing needs. BNY Brokerage, Inc. is a member NASD/SIPC, and is a wholly-owned subsidiary of The Bank of New York Company, Inc. Securities are not FDIC insured and may lose value. BNY Brokerage, Inc.
How can I convert ordinary shares in Blue Label Telecoms into Blue Label Telecoms ADRs?